This 4" x 6' long Interfaith Stole carries symbols of 12 major religions on a crisp white cotton background; the color of purity. It is appropriate for clergy, ministers and deacons or those who offer prayers at their local interfaith or multifaith gatherings. This Interfaith Stole is handmade in Bali and also makes a unique gift for a friend’s ordination ceremony! Our white Interfaith Stole is handmade in Bali and is popular among clergy, ministers, deacons, hospice workers, post-secondary Religious Life offices and many more who support and live diversity. 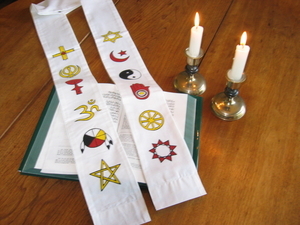 The Interfaith Stole includes the faiths of: (top right) Judaism, Islam, Tao, Jain, Buddhism, Baha'i; (top left) Christianity, Sikhism, African Goddess, Hinduism, Native American and Wiccan.